Here’s where we ended up leaving the Engsvanyali Tombs for the time being – we needed to restock on magic and climbing gear to bridge that last gap on the lower level and when we got back home we ended up caught up in all the minutia that comes with running a full Tsolyani colony on the southern continent. 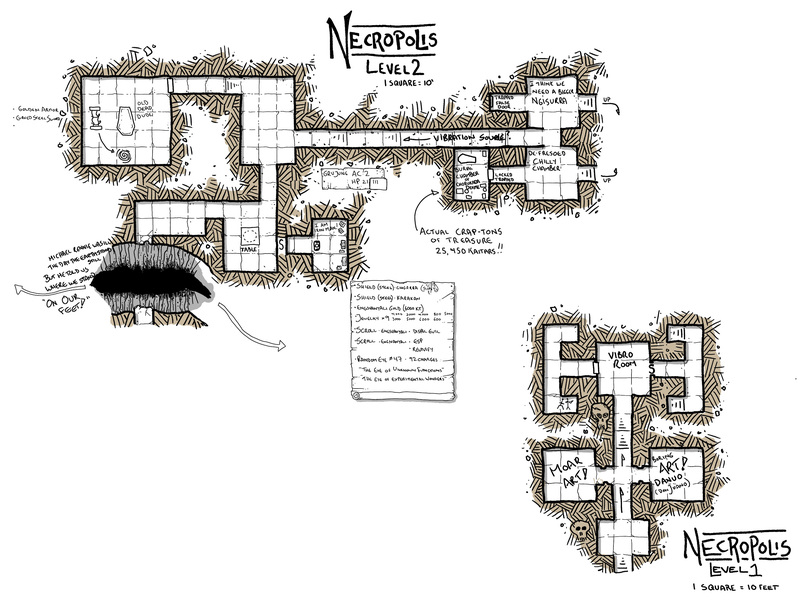 These tombs were drawn based on the GM’s descriptions as we played – I drew them using a graphics tablet in Photoshop while screen sharing my work with the group. This version includes a bunch of notes about our loot and explorations (as well as a Rocky Horror Picture Show reference). With all the Engsvanyali gold and jewelry we dragged out of there, I’m at the point of being just over 1,000 XP away from level 6 – and becoming a bona fide general (as well as the clan elder of the House of Worms clan in Linyaro). The rest of the session was spent in managing the city of Linyaro and figuring out where we were building clanhouses and temples to best impact the colony as well as advance our own political and religious goals. Claude Raines was the invisible man. Thanks you for sharing your skill and passion with us Dyson! I love your maps. Any advice for using them in roll 20?